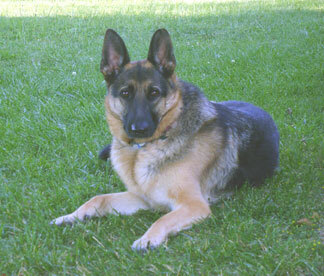 Hello - Attached you will find a picture of my GSD, Scarlet. I got Scarlet from the Speaking of Dogs rescue group in Toronto, On in November 2007. She is the best thing to happen in my world in a very long time. I had just moved to the country by myself and within a couple of weeks someone broke into my house during the day while I was at work. The only animal in the house was my 22 year old cat. I've never been certain, but I believe they did something to the cat as she was sick from that point on and died 3 weeks later. I was heartbroken and very, very lonely. Someone suggested I adopt a dog. I'd never had a German Sheppard before or really spent much time around large dogs, but when I saw her picture on the rescue's website, I knew we were meant to be together. Within a couple of weeks, she was in my home. At first I was a little worried about her background and how she would adapt, but with some love, lots of attention and a bit of training she very quickly caught on to the routine and has continued to thrive, grow and delight. I cannot imagine my life without her. I also can't imagine life without a GSD in it! Hi Nancy. And what a great picture you have sent of Scarlet too. Thanks so much for taking the time to come here and share your own personal German Shepherd story and picture of your beautiful German Shepherd Dog Scarlet with us all here.